Monticello trees with ivy removed. TreeSteward Tim Maywalt did the work and took the photo. 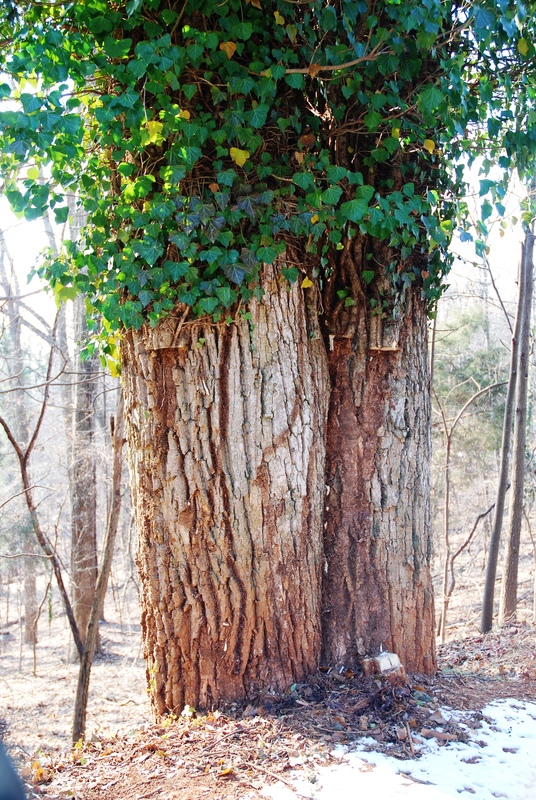 Article and photos by Tim Maywalt, graduate of 2011 TreeStewards Arlington & Alexandria and now active with Charlottesville Area Tree Stewards. After I moved from Arlington to the Charlottesville area, I was looking for a way to use my TreeSteward skills and when I visited Monticello for the first time, I knew . It’s about 20 minutes from where I live and what a wonderful place! But it has a lot of mature English Ivy (the fruiting kind, so propagation is by seed spread by birds that eat the berries – not creeping from planted ivy beds as is routine in Arlington). There is also plenty of poison ivy, wild grape and honeysuckle. Based on my experience with invasives removal in Arlington as a TreeSteward, I applied as a volunteer at Monticello. I was interviewed by Gabrielle Rausse, head of Grounds and Gardens and started work on January 14. My first day I was accompanied by one of the regular staff to ensure that I knew what I was doing, but since then I work alone. I go in three times a week and work a three-hour shift – this is heavy work! My proposal to Mr. Rausse was to take on the problem in phases. Phase I is to stop the spread of English ivy at Monticello. Phase II will be to control it for the long term. First priority in Phase I includes cutting or removal of invasives from the trees, fences, deadfall, buildings, etc. that are immediately visible to visitors to the facility. 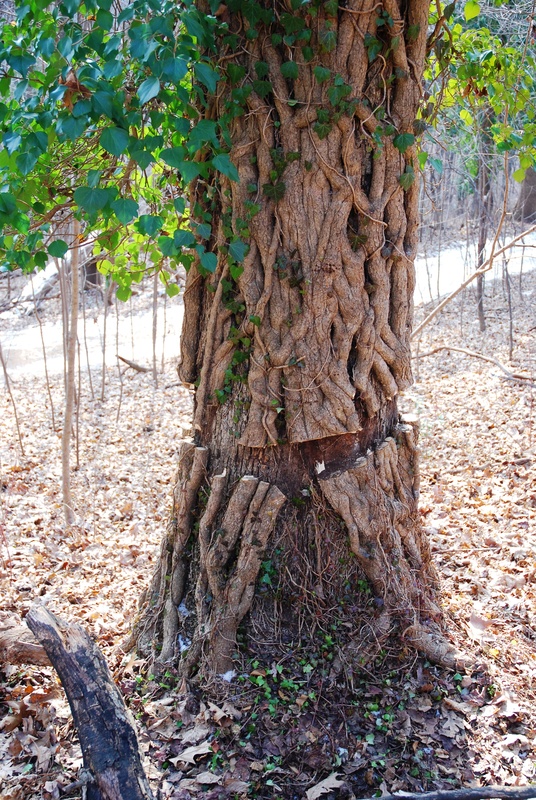 The second priority targets are those areas deeper into the forest that are not visible to visitors, but carry mature ivy that is fruiting and causing propagation by seed. With the exception of some help from the staff on the most heavily-infested trees (ones where chain saws are needed!) this is a one-person project and how long it will take remains to be seen. I won’t be able to accurately estimate duration until I complete my reconnaissance of the entire facility. This is prime time for cutting, so I haven’t been able to do a thorough evaluation of the extent of the work. 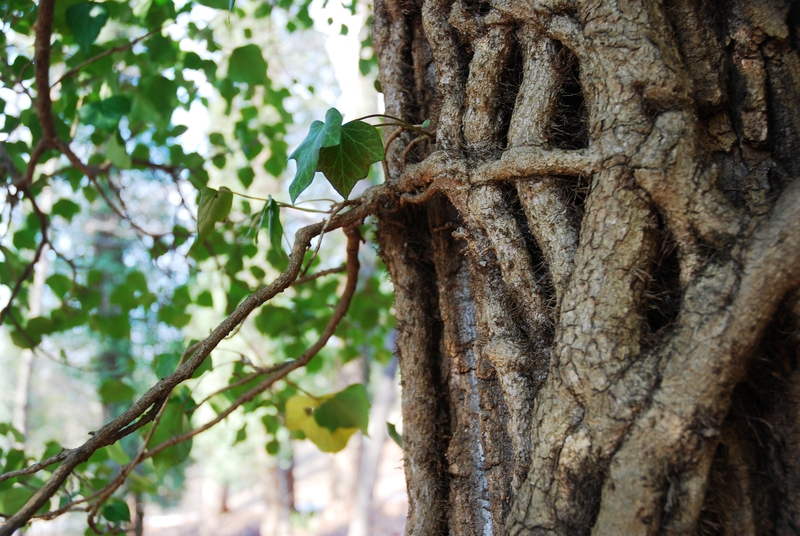 Ivy vines girdling tree at Monticello. I have worked 30 hours so far, and cut/removed ivy from about 200 trees. In the first section of the property that I completed a few days ago, there were about 400 trees over 6 inches and just fewer than 50% of them (46.6%) required invasives removal. Some trees just take a couple minutes to finish, but others take up to 45 minutes (as a volunteer at Monticello, I am not allowed to use a chain saw, which would significantly speed up removal from heavily infested trees.) I have hand cut ivy vines that exceed 8 inches. I counted the rings on one and it was 35 years old. There are bigger vines on about 50 trees and I am now marking those trees that need a chain saw to cut the ivy in order to save time. One of the regular staff will make those cuts. Note that when using a chain saw, the cuts will not be made all the way through the ivy trunks – they will stop about a half inch short of the tree itself and I will finish the cuts with a hand saw so that we don’t damage any trees. There are two benefits to this project – first, Monticello is one of only 16 World Heritage sites in the United States and the only one in Virginia. People come here from all over the world to see it and they see a lot of ivy! Second, Monticello’s widespread mature ivy needs to be controlled to eliminate propagation by seed to the surrounding area. It’s a real kick working on Thomas Jefferson’s trees. Come down and I’ll show you around! 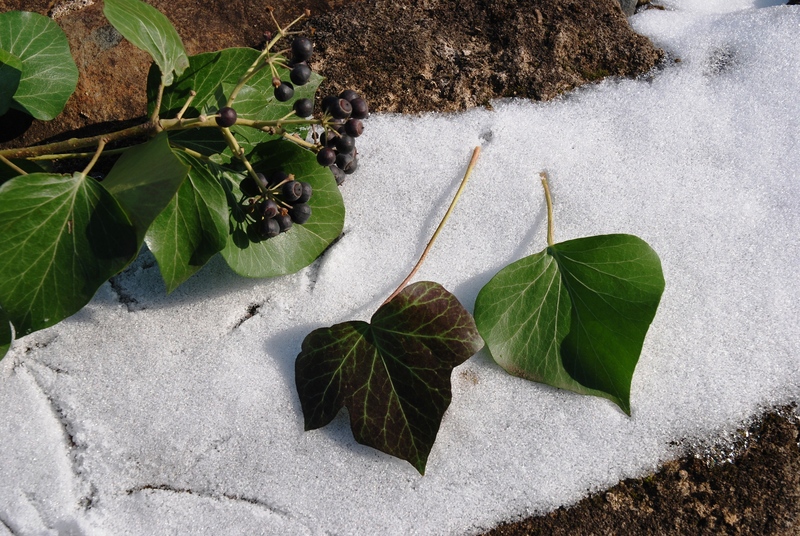 Note differences between immature ivy on left and mature on right, and the seeds. Ivy cut with power saw but stopped before trunk for hand sawing. This entry was posted in Community Service, Tree Care and tagged invasives, ivy removal, Monticello, volunteer opportunity. Bookmark the permalink. Very inspiring Tim. I am passing on a link to your article to friends in the C’Ville area. 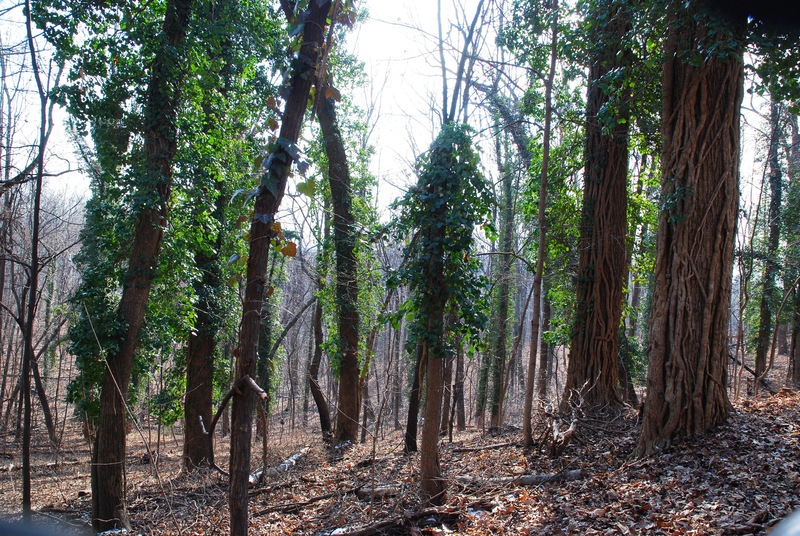 For a long-term solution to Monticello’s Ivy problem, I’d encourage you to advocate for funding for chemical treatment of the Ivy on the ground. With the scale of infestation on the trees, I can only imagine what it looks like on the ground, which would probably amount to decades of backbreaking volunteer mechanical work. Good luck!! Your work inspires, Tim. Thanks for this write-up. I see a field trip in the future!